Background Ankle sprain is the most common sports-related injury with a high rate of recurrence and associated costs. Recent studies have emphasised the effectiveness of both neuromuscular training and bracing for the secondary prevention of ankle sprains. Aim To evaluate the effectiveness of combined bracing and neuromuscular training, or bracing alone, against the use of neuromuscular training on recurrences of ankle sprain after usual care. Methods 384 athletes, aged 18–70, who had sustained a lateral ankle sprain, were included (training group n=120; brace group n=126; combi group n=138). The training group received an 8-week home-based neuromuscular training programme, the brace group received a semirigid ankle brace to be worn during all sports activities for 12 months, and the combi group received both the training programme, as well as the ankle brace, to be worn during all sports activities for 8 weeks. The main outcome measure was self-reported recurrence of the ankle sprain. Results During the 1-year follow-up, 69 participants (20%) reported a recurrent ankle sprain: 29 (27%) in the training group, 17 (15%) in the brace group and 23 (19%) in the combi group. The relative risk for a recurrent ankle sprain in the brace group versus the training group was 0.53 (95% CI 0.29 to 0.97). No significant differences were found for time losses or costs due to ankle sprains between the intervention groups. Conclusions Bracing was superior to neuromuscular training in reducing the incidence but not the severity of self-reported recurrent ankle sprains after usual care. With about a quarter of all injuries across all sports being ankle sprains, the burden of this injury in sports is high.1–4 Next to the sheer magnitude of the number of ankle sprains, the individual and societal impact of these injuries should not be ignored. A Dutch study revealed that the mean total costs of one ankle sprain are approximately €360.5 This means that in the Netherlands alone, with an estimated annual rate of 580 000 ankle sprains,6 an estimated €208 million is spent on sports-related ankle sprains each year. Apart from the societal burden due to the magnitude and economic consequences of ankle sprains, the impact on the individuals cannot be neglected. The latter holds especially true for the secondary complaints after an index ankle sprain. A recent systematic review revealed that bracing and neuromuscular training are effective for the secondary prevention of ankle sprains.15 Both are linked to a reduction in recurrence risk of approximately 50%. However, which of the two is most efficient in practice remains unclear.15 According to Verhagen and Bay,15 in theory, a combination of an external prophylactic measure with neuromuscular training would achieve the best preventive outcome, with minimal burden for the athlete. The recently published Dutch evidence-based clinical guideline14 advises both preventive measures to prevent a recurrent ankle sprain. However, a direct prospective head-to-head comparison of effectiveness between these interventions has never been performed. The aim of the current three-arm randomised controlled trial (RCT) was to evaluate the effectiveness of combined bracing and neuromuscular training, or bracing alone, against the use of neuromuscular training on recurrences of ankle sprain after usual care in athletes following an acute injury to the lateral ankle ligaments. This study was a three-arm RCT, with a follow-up of 12 months. A detailed description of the study protocol has been published previously.16 The study design follows the recommendations of the CONSORT statement17 and flow of the participants is shown in the flow chart. Participants were recruited from April 2010 to June 2011 through non-medical channels; that is, through advertisements on the Internet and via mailings of Dutch sports federations. For eligibility, participants had to (1) have sustained a lateral ankle sprain no more than 2 months prior to inclusion; (2) have an age between 18 and 70 years and (3) be actively participating in sports for at least 1 h/week. Before inclusion, an oral assessment of the reported ankle sprain was conducted by a sports physician to confirm eligibility. For this purpose an injury form as previously used in comparable studies was employed.13 ,18 The form included registration of diagnosis, cause and aetiology of the reported ankle sprain. Furthermore, treatment and type of practitioner were recorded. All primary treatment options were allowed, that is, no treatment, self-treatment or (para-)medical treatment. Potential participants were excluded if they (1) had insufficient mastery of the Dutch language; (2) had a history of vestibular problems or (3) were suspected to have sustained a different injury than an ankle sprain after interview by telephone. When the baseline questionnaire and the informed consent were received, participants were randomly assigned to one of the three intervention groups. Randomisation was stratified for care received (ie, medical vs non-medical primary care). Allocation of the participants to the intervention groups was concealed by application of participant numbers. Only after the participants had completed the baseline questionnaire and had provided written informed consent, they were assigned a participant number. A blinded research assistant allocated the participant numbers to one of the three intervention groups by using a random numbers table. Participants allocated to the bracing group (brace) received a semirigid ankle brace (Aircast A60 Ankle Support, DJO, Europe) to be worn during all sports activities for the duration of the entire 12 months of follow-up. The primary outcome measure was incidence of ankle sprains, measured according to the methodology employed by Hupperets et al.18 The participants were asked in the monthly questionnaires whether they had suffered a recurrent sprain in the past month. Secondary outcomes were the severity of the recurrent sprains and costs related to the recurrent sprains. A severity differentiation was made between self-reported ankle sprains, time loss sprains and sprains leading to costs. A sprain was categorised as a time loss sprain when it caused one or more of the following: the participant had to stop their sports activity and/or he/she could not (fully) participate in the next planned sports activity. Sprains that resulted in either self care costs, the participant not being able to go to work or school the next day, or that required medical attention were categorised as sprains leading to costs. A baseline questionnaire gathered information about each participant regarding demographic variables, physical characteristics, sports and injury history, use of preventive measures, details and injury mechanisms of the current ankle sprain, and subsequent treatment and/or rehabilitation. Follow-up measurements started after randomisation, once a month for a total period of 12 months. The monthly web-based questionnaires collected information on sports participation, use of preventive measures and ankle sprains sustained in the preceding month. The monthly questionnaire also measured compliance to the allocated intervention. Participants in each group were asked to what extent they had complied with the allocated intervention during the preceding month, these questions were asked for the duration of the respective interventions. Answer categories were: always (more than 75%); most of the time (more than 50%); a few times (about 25%) or almost none of the time (0%). Apart from compliance with the prescribed intervention, use of other interventions was registered also with the same methodology. Ankle sprain recurrence incidence densities, henceforth referred to as incidence, were expressed as the number of new recurrences per 1000 h of sports participation, including their 95% CI, with exposure time of each individual participant until the first recurrent ankle sprain. Missing exposure data were imputated using ‘last observation carried forward’. We also carried out a subgroup analysis on medical care for the inclusion ankle sprain. 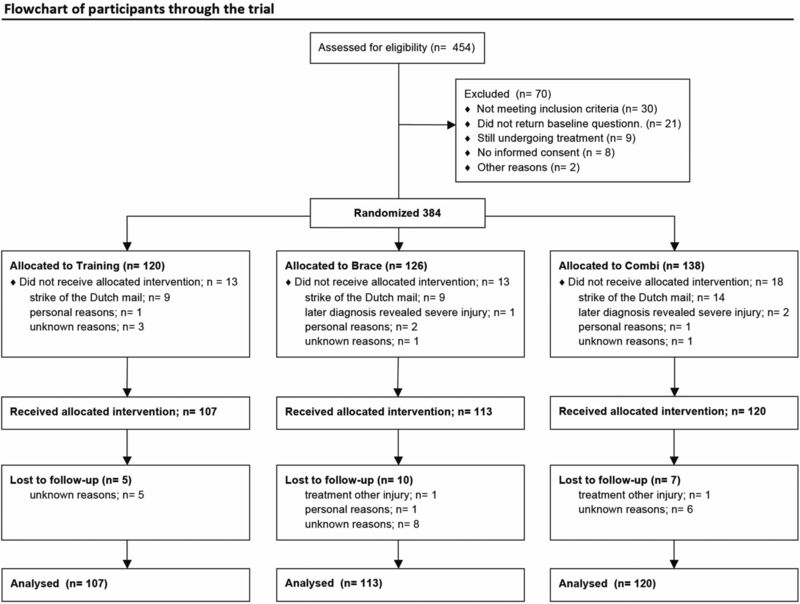 All analyses were carried out according to the intention-to-treat principle on participants who received and started their allocated intervention (figure 1). Cox-regression survival analysis (SPSS V.20) was used to compare ankle sprain recurrence risk between the different groups with the training group as the reference group, using a significance level of p<0.05. The presence of confounding or effect modification was checked for the variables: age (years); education (high/low); high-risk sport (yes/no); previous ankle injury (yes/no); severity of inclusion sprain (grade 1 or 2/3); experience with neuromuscular training (>3 sessions a week, during at least 1 month); experience with bracing/taping (brace or tape use during sports for at least 1 month) and chronic ankle instability (>3 sprains within last 5 years). Between April and June 2011, 384 participants were recruited and randomised to one of the three intervention groups. Between April and June 2011, 384 participants were recruited and randomised to one of the three intervention groups (figure 1). Forty-four participants did not receive or start their intervention; therefore, data from 340 participants were included in the analyses. Stratification created a lower percentage of medically treated participants for the brace group (medically treated; training 69%; brace 58% and combi 68%). The groups were comparable to all other measured variables at baseline (table 1). The dropout rate was similar between groups (figure 1). Total hours of sports participation during the 12-month follow-up period were not significantly different between the three intervention groups: 11 566 h in the training group, 12 679 h in the brace group and 12 931 h in the combi group. During the 12-month follow-up, 69 participants (20%) reported a recurrent ankle sprain; 29 (27%) in the training group, 17 (15%) in the brace group and 23 (19%) in the combi group. The overall incidence of recurrent ankle sprains per 1000 h of sports was 2.51 (95% CI 1.51 to 3.42) in the training group, 1.34 (95% CI 0.7 to 1.98) in the brace group and 1.78 (95% CI 1.05 to 2.51) in the combi group. Cox-regression analysis showed that the risk of self-reported recurrences of index ankle sprain was significantly lower for the brace group versus the training group (relative risk 0.53; 95% CI 0.29 to 0.97) and also lower, and not significantly different for the combi group versus the training group (relative risk 0.71; 95% CI 0.41 to 1.23). Relative risks for ankle sprains leading to time loss and costs were also lower for the brace and combi groups versus the training group, but not significantly (table 2). Full compliance ranged from 50 (45%) participants in the training group, measured during the 2 months of neuromuscular training prescription, to 27 (23%) participants in the brace group, measured during the 12 months of ankle brace prescription. Within the combi group 40 (33%) participants fully complied with the neuromuscular training component, and 46 (38%) participants complied with the bracing component, measured during the 2 months of neuromuscular training and ankle brace prescription. This resulted in an overall full compliance of 34 (28%) participants in the combi group. There was also intervention spill over. A total of 16 (15%) participants in the training group wore a brace in the first 2 months during training and competition; 17 (15%) participants in the brace group consistently performed neuromuscular training, defined as more than 3 sessions per week, in the first 2 months. Recent trials have found reductions in the incidence of ankle sprain recurrences for bracing and neuromuscular training when used individually as secondary preventive measures.19 ,20 One previous trial by Schroter et al21 investigated bracing and neuromuscular training in recreational basketball players during one season. In this RCT, where 48% of the participants had a previous ankle sprain, bracing and neuromuscular training were compared as primary and secondary preventive measures versus a control group. Comparability with this trial is limited as different brace types were used and the neuromuscular training programme was not home based, but embedded in regular training. However, the reported incidence rates of ankle sprains are comparable to ours and lead to a comparable conclusion; 1.97 sprains/1000 h sports participation for neuromuscular training; 1.0/1000 for bracing; and 3.26/1000 for the control group. Recruitment for this study was Internet based. Participating medical and sporting associations, as well as related sports news websites placed a hyperlink to our call for participation on their website. Here, individuals seeking medical information regarding ankle sprains on any of these websites were informed about our study. This method of recruitment resulted in a sample of participants from a wide spectrum of different sports and ages. In 2011, 94% of the Dutch had an access to the Internet,22 therefore selective recruitment was considered to be minimal. However, selection bias may have been introduced by the fact that individuals seeking medical information on the Internet probably represent the population with a more active coping strategy. This contention is supported by the fact that 56% of the included athletes were highly educated. Therefore we assume that our study sample represents the part of the population with a higher motivation for self-treatment than the general public, potentially leading to an overestimation or underestimation of the differences between the interventions. Our definition of a recurrent sprain was a self-reported recurrence of an inversion trauma to the ankle. This included minor sprains or sensations of giving way and more severe sprains that led to the time loss or even costs. The sports physician, who assessed whether a report concerned a recurrent sprain was blinded for group allocation, therefore the risk of detection bias was low. Bias due to selective dropout was limited, as loss to follow-up was only 6%. The number of participants lost for unknown reasons was comparable between groups (training 5, brace 8 and combi 6). Two participants were lost to follow-up because of a more serious injury of a different nature than ankle sprain. Finally, one patient in the brace group decided to stop participating because of personal reasons. There were some other limitations more closely linked to the design of the trial. Initially, a fourth non-treatment control arm was planned. The ethical committee, however, argued that it would be unethical to withhold a well-studied effective intervention from this control group. Although this has resulted in the omission of a true control group, we feel the results are still of value. The effects of the preventive measures have already been well described in the literature.15 ,18 ,19 ,20 First, the current trial was conducted to compare these different measures against each other. Second, because we used a simple random number generator for the randomisation scheme, in two strata, groups were not evenly distributed. Third, we have not shown any significant differences for the medically treated and non-medically treated subgroups presented in table 2, most likely this is the consequence of loss of statistical power (type 2 error). The Dutch Consumer Safety Organisation (VeiligheidNL) implemented the home-based training programme, as performed in the training group, as an iPhone App during the course of the study.23 Although by the stage the App was released most participants (>75%) had received their intervention, this may have introduced performance bias. Secondary analysis revealed that 15% of the participants in the training group wore a brace during sports for at least 2 months, and 15% of the participants in the brace group performed regular neuromuscular training (>3 sessions/week) in the first 2 months. This amount of cointervention may have diluted the difference in effect between the intervention groups. If there was an effect of cointervention, then the calculated difference in effect between the interventions may be an underestimation. Full compliance varied considerably between the intervention groups. The relatively high percentage of fully compliant participants in the training group (45%) implies that neuromuscular training is currently more widely accepted as a secondary preventive measure in the Netherlands than a few years ago. The study by Hupperets et al18 ,24 reported full neuromuscular training compliance for only 23% of participants. It should be taken into account that compliance rates were calculated over different time periods. The compliance in the training and combi (full compliance 28%) groups only accounted for the duration of the concerning intervention, eg, 2 months, whereas the brace group (full compliance 23%) had to be compliant for the whole 12 months of ankle brace prescription. Moreover, at 2 months of follow-up the full compliance in the brace group was still high at 48%, slowly dropping to 44% after 3 months of follow-up. Therefore, one could argue that bracing is actually the best accepted intervention in our trial, which is a possible explanation for the superiority of bracing over neuromuscular training for the prevention of self-reported ankle sprains. The comparison of compliance rates between interventions over different time periods poses a study design issue of interest while it has been described in the literature that compliance rates affect intervention outcomes significantly.24 Prolonged prescription of an intervention may lead to a reduced compliance, thereby diluting an intervention effect. For the current study, however, the question was on effectiveness and an effect of decreasing compliance rates over time increased external validity of the reported results. Practitioners treating athletes progressively rely on evidence-based guidelines for advice not only on treatment, but also on prevention of ankle sprains. While during the last decade various studies emphasised the effectiveness of neuromuscular training and bracing for the secondary prevention of ankle sprains, the clinical guidelines are still vague on their actual implementation. In this trial, bracing was superior to neuromuscular training in reducing the incidence but not the severity of self-reported recurrent ankle sprains after usual care. We encourage future studies to investigate the effects of bracing and neuromuscular training on patient-reported outcomes such as pain and instability, and to quantify the clinical relevance of self-reported ankle sprains. Bracing is superior to neuromuscular training for the prevention of self-reported ankle sprain recurrences. Bracing is associated with an added 47% reduction in risk of recurrence versus neuromuscular training. Full compliance to neuromuscular training and bracing as individual home-based interventions was 45% and 48%, respectively, in the first 2 months, but when the interventions were combined the compliance dropped to 28%. Although the current clinical guidelines are vague on the prescription of neuromuscular training and bracing, the study results support the prescription of bracing as single secondary preventive measure for the prevention of self-reported recurrences. As in our study bracing was proven effective when prescribed during sports for 12 months, the prescription period of brace use in athletes needs to be extended, instead of being phased out. The authors would like to thank DJO for supplying the Aircast A60 ankle support braces. The Rock balance boards were available from the previous study by our group (2Bfit study), provided by Avanco, Sweden.
. The epidemiology of ankle sprains in the United States. J Bone Joint Surg Am 2010;92:2279–84.
. Epidemiology of lower extremity injuries among U.S. high school athletes. Acad Emerg Med 2007;14:641–5.
. Injuries in young elite female soccer players: an 8-season prospective study. Am J Sports Med 2008;36:276–84.
. Sportblessures in Nederland; een nieuw en actueel overzicht. Sport Geneesk 2009;42:16–23.
. Risk factors for lateral ankle sprain: a prospective study among military recruits. Foot Ankle 1991;12:26–30.
. An epidemiological survey on ankle sprain. Br J Sports Med 1994;28:112–16.
. Chondral injuries of the ankle with recurrent lateral instability: an arthroscopic study. J Bone Joint Surg Am 2009;91:99–106.
. Optimising ankle sprain prevention: a critical review and practical appraisal of the literature. Br J Sports Med 2010;44:1082–8.
. Ankles back in randomized controlled trial (ABrCt): braces versus neuromuscular exercises for the secondary prevention of ankle sprains. Design of a randomised controlled trial. BMC Musculoskelet Disord 2011;12:210.
. CONSORT 2010 statement: updated guidelines for reporting parallel group randomised trials. BMC Med 2010;8:18.
. The effect of lace-up ankle braces on injury rates in high school basketball players. Am J Sports Med 2011;39:1840–8.
. Neuromuscular training with injury prevention counselling to decrease the risk of acute musculoskeletal injury in young men during military service: a population-based, randomised study. BMC Med 2011;9:35.
. Prevention of ankle injuries during basketball by using orthoses or proprioceptive training. Deutsch Z Sportmed 2005;56:215. CBS. Nederland Europees kampioen internettoegang. 2012. http://www.cbs.nl/nl-NL/menu/themas/bedrijven/publicaties/digitale-economie/artikelen/2012-3636-wm.htm (accessed 25 Jun 2013). VeiligheidNL. Versterk je enkel. Stichting VeiligheidNL. 2011. https://itunes.apple.com/nl/app/versterk-je-enkel/id456001033?mt=8 (accessed 25 Jun 2013). Contributors EALMV conceived the idea for the study. EALMV and KWJ participated in formulating the study hypothesis, developed the intervention, and interpreted the data, discussed core ideas and participated in writing of the manuscript. KWJ recruited participants. WvM discussed core ideas, contributed to writing of the manuscript, and is the guarantor. Funding The study was funded by the Netherlands Organisation for Health Research and Development (ZonMW), grant number 80-82310-97-10063. DJO Europe provided the Aircast A60 Ankle support braces, worth €5000. Ethics approval The study was approved by the medical ethics committee of the VU University Medical Center, Amsterdam, The Netherlands (protocol number 31785.029.10) trial register number NTR 2157. Data sharing statement Data are available on reasonable request from the authors. Full dataset available from the corresponding author at e.verhagen@vumc.nl.